This was the desperate plea of a 21-year-old in March last year after hearing they were about to be put on a secretive government night flight sending people to Nigeria and Ghana. This distressed message was posted on the Detained Voices website, a collective which publicises the plight of people in detention. Another cry for help came from a lesbian woman who said her abusive ex-husband knew she was being deported and he was going to kill her on arrival. She had come to the UK believing she would be able to live freely as a lesbian, something she couldn’t do in Nigeria, where LGBTQ relationships are illegal – punishable by death or imprisonment. Believing these and other fears were well-founded, we decided to respond to these distress calls by stopping a Titan Airways flight due to deport these frightened, vulnerable people from the UK. We locked ourselves to each other around the nose-wheel of the plane at Stansted airport. It was direct action, wholly peaceful and in our minds a clear matter of conscience. Our sweatshirts read “mass deportations kill” and “no one is illegal”. 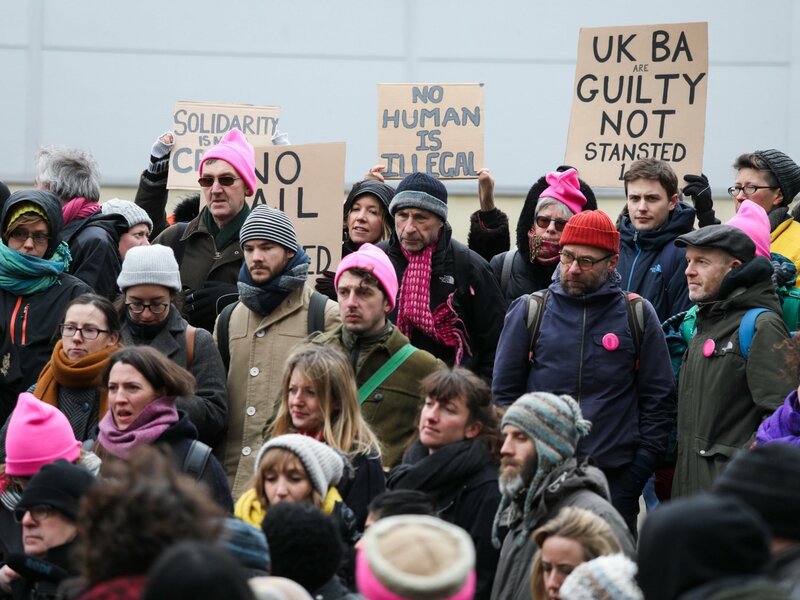 As direct result of our actions 11 of the 60 people scheduled to be on the plane are still in Britain fighting their cases. These include trafficking survivors – women who had escaped sexual slavery – and asylum-seekers with ongoing claims. Two people have since secured permission to stay in the country. But months after our intervention we ourselves were charged with “endangering safety at an aerodrome”. We’ve just been found guilty with sentencing due to happen in February. The maximum sentence for this is life imprisonment.